In this blog entry, Dangerous Trade co-editor Christopher Sellers discusses industrial dangers, past and present, and how people have sought to discover and correct these hazards. Over the past few months, a burst of stories have made headlines in the New York Times and elsewhere about dangers of what we buy and use have posed to those in foreign lands. First came a harrowing report last December about what was happening to car batteries that Americans had used up and discarded. A growing business has emerged of shipping these batteries to Mexico, where around disassembly plants, lead has been steadily escaping into the air and soil, to poison neighborhood children. Then came the coverage of China’s Foxconn, manufacturer of Apple’s i-pad. We learned that this latest, dazzling digital wonder, brought to us by one of America’s most respected and successful firms, had come with a cost none of us knew about or had bargained for. Workers in China had paid, instead, with lengthy work-days, exploitative and sometimes toxic working conditions, and distress that could reportedly turn suicidal. Scientists and scholars who have followed these industrial dangers for years have to applaud the media’s new in the distant hazards imposed by our own consumer purchases. The rising awareness suggests the prospect that, finally, more effective ways of mobilizing and intervening against them may arise. Those of us who have followed this kind of issue, and sought to dig up its history, have to conclude that these sporadic reports offer only a visible tip of what is likely a global iceberg. International studies suggest that occupational diseases alone kill more throughout the world than malaria. These numbers do not include the many additional casualties from contaminants in the air, water, and soil. With rebounding economic growth throughout the world, this toll is no doubt on the rise once again, especially in the developing world. A starting point for understanding how and why these dangers continue to recur is to recognize that this problem is far from new. 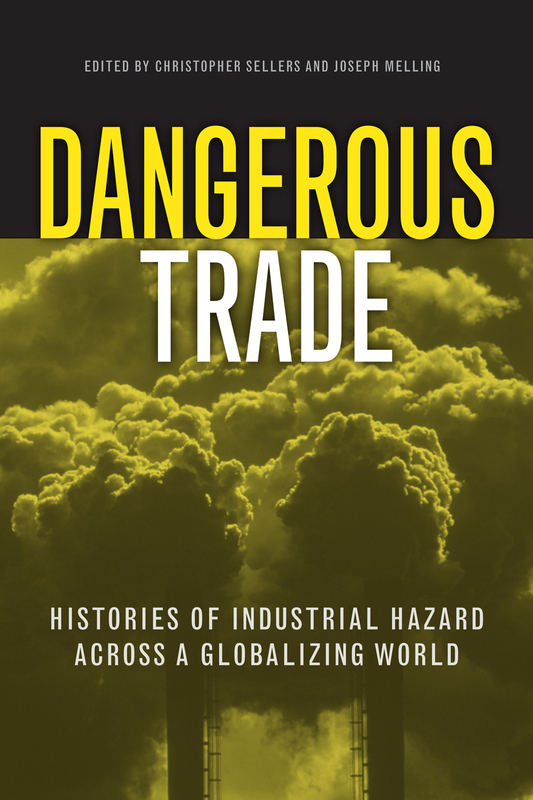 Dangerous Trade: Histories of industrial hazard across a globalizing world, is the first book to take a genuinely global approach to their history, one that encompasses both the developing and the developed world. Dangerous Trade explores the contours of this kind of problem not only in our contemporary world, but historically, through the past century and more of what has been a long-standing trade in industry-derived dangers. In every period when international trade has picked up, the most hazardous industries have tended to cross national boundaries, to gravitate to where regulation and awareness of the attendant hazards remain less. Looking at examples from colonial Malaysia’s mining industries to the extraction of oil in Mexico, this book’s essays offer rigorously documented accounts of just why and how these dangerous industries arose where they did, and the ways in which locals strove to cope with them. As these essays make clear, the ways and means by which dangerous activities travel has nevertheless been shifting over the last century. As technology has changed, nations especially in the developed world have come up with new and more effective ways of recognizing and correcting the worst hazards. The result, however, is hardly one of unadulterated progress. Instead, these hazards endure, if in changing and ever more wily ways. They get shipped elsewhere, where the companies that rely on them, and the consumers who give these companies their business, can once more put their dangers out of mind. Hence, the resurgence of poisonings from lead, perhaps the longest known and most studied of industrial hazards, but still sickening workers and children from Uruguay to Mexico in our contemporary world. This collection constitutes a first effort to ask how and why these problems have persisted, even decades after new efforts have arisen around the globe successfully to identify and address them. A central concern of the collection, as well, is to generalize cross-nationally, about the evolving repertoire through which people in different times and places have sought to discover and correct these dangers, once they arise. 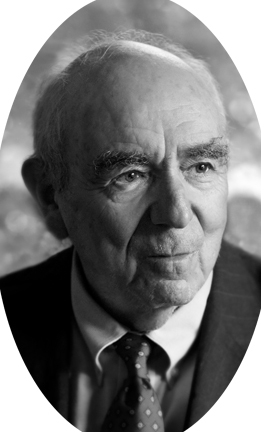 From the early health departments to worker compensation laws of the early twentieth century, to the environmental legislation starting in the sixties and seventies, to latter day campaigns to ban a dangerous substance like asbestos, the tools and targets of those who would ameliorate these dangers have constituted a work in progress. Often it is precisely the loopholes in an earlier system of control that make a later one necessary. But a key theme as well is that amelioration has not been a given even once the hazards became unmistakable to the experts and officials in charge. Expert activism was often important in calling attention to new hazards, but as if not more important in stirring real change was the mobilization of the inexpert. From the workers in Mexican oil fields to the environmental agitators in late twentieth century France and Uruguay, those who were themselves the victims of these exposures also had to mobilize, to marshal the available political tools to induce governments as well as scientists to consider their problems. If these histories suggest just how persistent industrial hazards like lead or asbestos can be, together they also offer many grounds for hope. Not just failures but success stories abound here, of mobilizations fighting asbestos and lead battery-burning and pesticides and liquefied natural gas facilities. In addition to elucidating these problems’ persistence, these essays thereby offer an abundance of models that may inspire today’s practitioners, activists, policy-makers, and citizens, and on which they may build. Q: You have followed politics closely all your life. What’s the appeal of covering elections and getting to know your candidates? A: Beyond politics being the lifeblood of this republic, following an election as it transpires has all the excitement of following a sports team with which you identify, only with profoundly more significance––and enhanced by getting to know some of the players personally. Q: Toomey’s Triumph is not an authorized campaign tract. It is a very personal, unbiased reflection on the 2010 Senate election. How did you develop your approach to the book? A: This is a book of my reflections. I asked questions during meetings with the Toomey team, but never intruded with suggestions. I was a highly interested observer, even sometimes a companion of staff members, but not a partisan. To get the feel of a political campaign, you need to look inside it. What are they trying to stress, where, and with whom? How do events develop and strategies change, as viewed through their headquarters? Inevitably you develop an empathy with those you are close to, while trying to objectively portray their equally committed opposition. Q: You could not have known when you started work on Toomey’s Triumph that the election would end the way it did. Why did you choose this particular election to cover? A: I agreed with Chris Matthews that the 2010 Toomey-Sestak senatorial race would be “the most riveting in the nation”––what I termed a microcosm of the great national divide, pitting an impressive Republican conservative against an impressive Democratic liberal. It was clear from the outset that the outcome would be close, but the race might rise above others as a more compelling contest. Who wouldn’t want to write about it? Q: How did you get access into the Toomey campaign? Would you have been a “fly on the wall” in the Sestak campaign if Toomey’s camp had turned you down? A: Initially I was considering trying to create this book from the inside of all three campaigns. But I wrote month-by-month as the events transpired. Because the Toomey people were most receptive, working through them seemed the best approach; and subsequently I signed a confidentiality agreement with Pat Toomey. Q: You describe in detail, the extensive fundraising efforts of the candidates. Do you believe that “whoever has the most money, wins the election”? A: Even in these times, money does not always determine the outcome of elections. After the Democratic primary, Sestak’s financial support increased. Ultimately more money was spent to defeat Pat Toomey than any other Republican candidate running in 2010. Toomey’s own resources, however, were substantial throughout. Q: Your book is a real primer on what it takes to get elected. You write about the demands an election has on a candidate—the stamina needed to run, as well as how the candidates appear in the media and in person at major events. What did you observe watching these competitors? A: There was a profound contrast, not only between the ideologies of Toomey and Sestak, but also in their styles of campaigning. Both were inexhaustible, but Toomey “never seemed to tire or perspire.” Sestak appeared almost frenetic, appealingly earnest, but determined to leave nothing unsaid and no hand ungrasped. Toomey sometimes seemed almost too low-key, but invariably was better organized, controlled, concise, and consistent in both his manner and message. Q: Toomey’s Triumph also reveals the importance of television ads and competent staffers. Where there any particularly “bad” moments for the candidates that you observed that made for particularly good chapters of your book? A: Sestak’s TV spot depicting Specter in the Democratic primary as only interested in preserving his own job was devastating. The most memorable TV ad in the general election was Sestak’s comparing his dog’s “poop” to Toomey’s claims—but it backfired. The really extreme advertising was from outside groups. Again, Toomey’s more appealing approach, featuring his family, was very consistent. He pictured Sestak not as evil, but as simply too liberal for Pennsylvania. It is ironic: Toomey was initially considered too conservative for this Commonwealth, but the overriding economic issues rendered his message more timely. Q: Have you stayed in touch with Toomey since his election, and have you been supportive of his work as Senator? A: Pat Toomey and I are not intimates. We don’t exchange correspondence. My meetings with him during the campaign were entirely pleasant, but infrequent and brief. I think he went along with the book because his staff liked the idea. I have heard subsequently from people on the Toomey team, many of whom are now on his Washington and Pennsylvania staffs. I am encouraged by Senator Toomey’s conciliatory attempts to reach across the aisle for potential areas of compromise, rare in these times. I believe he will become a major legislative leader. Q: What did you learn covering 2010 that you would tell candidates running this year? A: I’ve come to feel that, particularly in close elections, the apparent demeanor of a candidate can be at least as significant as his/ her ideology. By every measure, the overwhelming concerns of the electorate in 2010 were the economy and jobs. 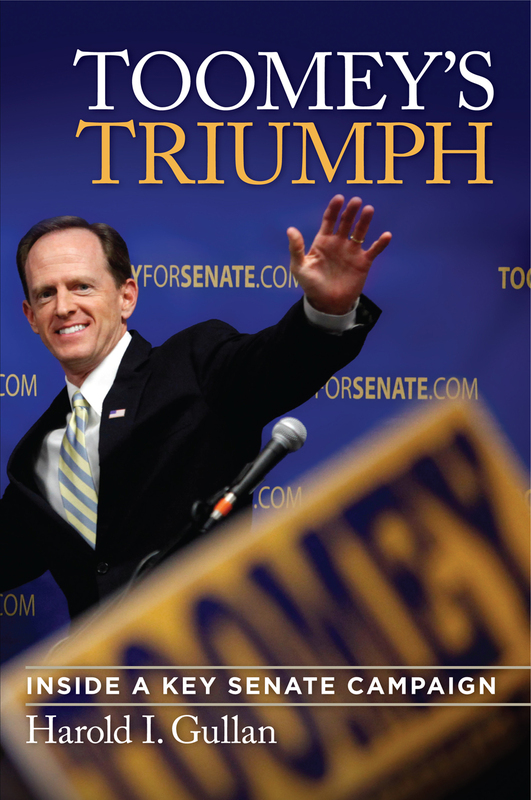 Unfortunately, they still are –– rendering the message of “Toomey’s Triumph” even more relevant today in 2012.